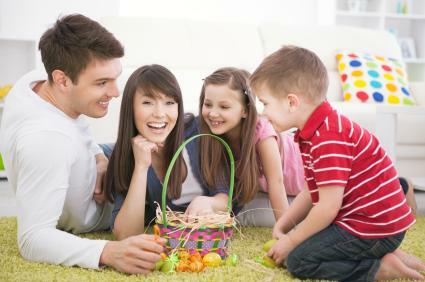 Easter celebrations often include good food, family and friends, and fun activities. Consider adding a few great games to your holiday celebration to add a new twist and extra excitement to the day. There are games that can be played by people of all ages. Little kids like games that are easy and fun to play. There are many games that can incorporate an Easter theme. All you need for this game is construction paper, markers and scissors. Draw and decorate a variety of eggs on construction paper. Cut the eggs out of the construction paper, and then cut each egg in half. Hand each child one egg half, and instruct him or her to find the match to that half. This is a great party starter, especially if there are several children in the room who don't know each other. 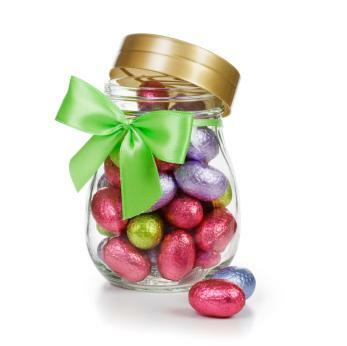 Fill a large, glass jar with candy eggs, and make sure you count how many you put in. Have each child say or write down the number of eggs he or she thinks is in the jar. The child who guesses closest to the correct number of eggs can either receive a prize or be awarded the candy-filled jar. Allow kids to show their creativity by holding an Easter drawing contest. Divide children into two teams, and hand each team an art pad and pencils. Write various Easter-related objects, such as "bunny," "egg," etc., on slips of paper. Place them into a basket. When the signal is given, one person from each team selects a slip of paper and draws the object on the pad. Team members should then attempt to guess the drawing. As soon as members correctly guess the drawing, the next person on the team should then select a slip of paper and do another drawing. The team who finishes drawing and correctly guessing all of the objects first wins. 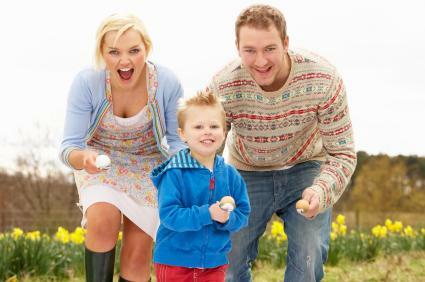 Take the traditional Simon Says game and turn it into an Easter game. Choose one person as the "bunny." He or she will then issue commands to other players in the room. For a fun twist, have the person wear a pair of bunny ears. All the players should line up, and the bunny should stand in the area that will be the finish line. If the "bunny" doesn't preface his command with "Bunny says," the player should not do what is ordered. If the player does perform the command anyway, he or she must go back to the original starting point and start over. Common commands may include "Bunny says take three bunny hops forward" or "Bunny says take one giant leap forward." The person who makes it to the finish line first wins. This game is a fun twist on the favorite Pin the Tail on the Donkey. Create a large Easter bunny cut-out and tape it to a wall or door. Have a container of cotton balls and pieces of tape ready to be used as the tail. Place a blind fold over the children's eyes and have them take turns trying to pin the tail on the Easter Bunny. The following games are easily adapted to make them more appealing to older children. Divide kids into teams. The number in each team will depend upon how many kids are playing, but there should be at least two or three per team. Assign a specific egg color for each team. For example, team number one has blue plastic eggs, and team number two has green plastic eggs. 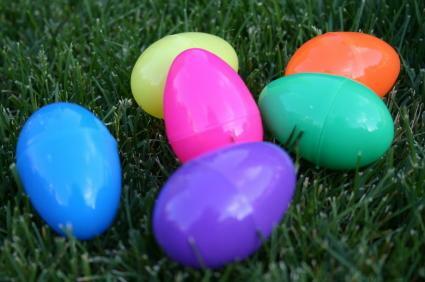 Place pieces of paper in each egg with clues and items that must be collected. For example, the clue might read something like, "Collect two pinecones and proceed to egg number two." Next, place a hint on the paper about the location of egg number two. Each team needs to understand that they should only look for their particular egg color, and that they should not touch another team's egg if they see one. The winning team is the one which finds all of their specified eggs first. Be sure to have some kind of prize on hand, such as candy, gift certificates, etc. If kids are playing throughout a neighborhood, be sure they know their boundaries so that they aren't tromping through an unsuspecting neighbor's yard. As each guest arrives, have her turn her back to you. Carefully pin a small stuffed animal securely to her back. Do not let her see which kind of animal you are pinning. Instruct guests not to look in mirrors during the game. Throughout the party or during a specific period of time, players walk up to other guests and ask them questions about the animal on their back. These questions must be phrased as "yes" or "no," and they should be designed to give hints about the animal. For example, questions might be "Do I have wings?" or "Can I swim?" When instructed, kids should call out what they think their animal is. The winner is the person, or persons, who guess correctly. For this game, children are divided into two teams. Each team is given a set of flags which team members must guard. Flags are either placed on or stuck into the ground, and team members must guard their flags from the opposing team. At the same time, teams try to "hop" over to the other team's side to steal the flags without being tagged. Players can only hop as they play, not walk or run. The team who captures the most flags at the end of a specified playing time wins. You can put your own spin on old favorites that will appeal to people of all ages. Give each guest a spoon and an egg. The egg can either be raw or hard-boiled. Each player must balance their egg on the spoon and race to the finish line. Whoever drops their egg is out. The winner is the first to make it to the finish without breaking or dropping their egg. For lots of laughs, play this game of charades. Before the party, write down words and phrases related to Easter and place them on slips of paper and put them into an Easter basket. Have each guest draw a slip of paper from the basket. You can also divide the group into teams. Each person must act out whatever word or phrase they draw. The person or team with the most correct guesses wins. Some words related to Easter include bunny, hop, carrot, church, cross, and candy. Give each team an egg. Guests must use their neck or even feet to pass the egg to the next person in line. No one can use their hands or they are out. The first line to complete the task wins. Begin planning your Easter party ahead of time and make use of your creativity by adding a few fantastic games in which everyone can take part. Games are a great way to bring your guests together and turn the holiday into a fun and memorable event.